I do not like to be the leader. I can do it if I have to, but I would much rather be helping behind the scenes than be the visionary out in front. In fact, in our small ladies’ group at church I agreed to become the secretary/treasurer partly so that no one would ask me to lead. 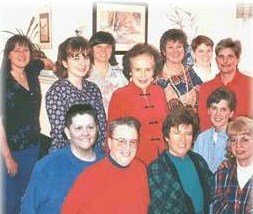 Several years ago I was asked to co-lead our entire women’s ministry, of which our little ladies’ group was a part. It was only out of sheer politeness that I did not burst into laughter and run screaming down the hallway. I did say I would pray about it, but secretly I was scheming for any excuse not to do it. God, however, was having none of my shenanigans. Once I finally admitted that He might actually want me to take on this responsibility, I began to lay my fears at His feet. A couple of days later I had my theme and co-leader. The desire came more slowly. I began to see our women differently. Women who were simply part of the congregation soon became women with unmet needs, needs our women’s ministry could address. I found myself wanting to help meet those needs. My spiritual eyes were opening and my heart for our women was expanding. Not only was it expanding, soon it was taking me places I couldn’t have imagined. God’s desire for His women, the desire He gave to me, grew to include a reexamination and revamping of women’s ministry at our church. If God has a plan for you--and He does--He will give you the desire to fulfill it.